This wall in my living room is driving me up a wall! It's plain and uninspiring, not to mention, oh yeah, BOR-ING! So let me have it, what kind of ideas can you come up with for this wall? If you need to see the rest of the room to help get those creative juices flowing, look here. Also, if it helps, this wall measures almost 11 feet wide, our ceilings are 9 feet high, so it's a fairly big wall. I have assorted decorative items scattered on my dining room table, but honestly, I'm at a complete loss. HELP! Please? Oh yeah, one last thing...can I keep the mirror? Hello: Can you take pics of the assorted items and give us some ideas? Do you want make new purchases or are you only using items you already own? Keep the mirror but paint it, it just gets lost on that wall. What about a shade of blue like your pillows or another color you like. I think big walls are hard. That's why I love my picture wall in the dining room because it finally fills the wall up! What about an art wall? What happened to all of the pictures from your old wall, could you repaint the frames? If I have a big wall I always add a hanging shelf, or shelves, just to kind of break it up and add interest. I would put them to the left of the mirror, with some neat nick naks. I am definitely not a decorator so, you better wait for more comments ha! Hi Gina....the first thing that came to my mind is perhaps having two hurricane sconces on each end of the mirror...you can fill them with shells..and pretty blue candles to have like that coastal feel...now that everything is so light and bright and fresh and airy...that is the feel I get. 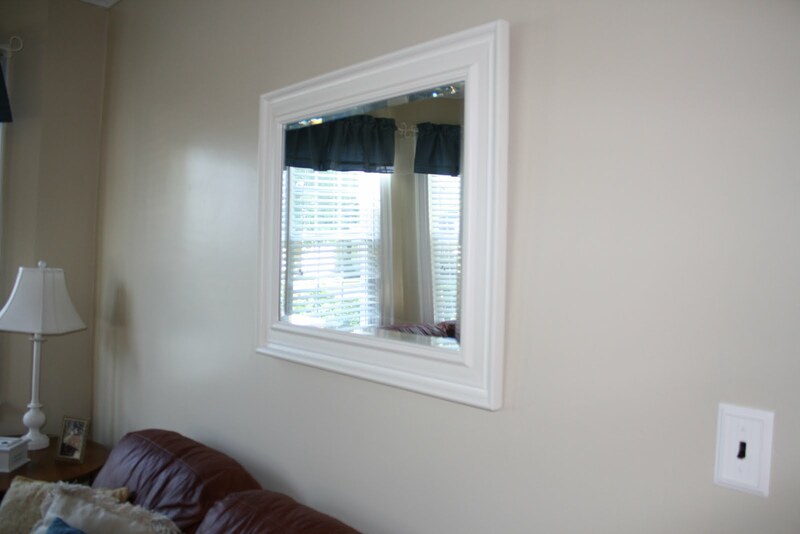 What about keeping the mirror and adding a few more in different sizes and shapes...you could even add in some pictures in frames too. print candid shots of your kids & fam. find mismatched frames, spray paint them all the same color... and go nuts. load it up. i'd even do it right around the frame. good luck!